Candidates already work hard to engage students; now it’s the students’ responsibility to respond. Every year around this time I am bombarded with familiar signs and slogans broadcasting the annual rivalry for student government. The chalked pavements, free food, candidate Facebook groups and barrage of posters lining the SUB have been used as common campaign strategies since my first year. However mesmerizing this spectacle of competition may be, I have often wondered whether such marketing has had an effect on our students. In fact, if candidates didn’t participate in these ploys, would students still be interested in the election? According to a recent Gazette article, voter turnout at DSU elections ranged between 14 to 20 per cent every year, with last year at a low 13.8 per cent. These statistics are surprising considering the degree to which candidates advertise themselves. Recent years have seen the rise of websites, online videos and social media networks, which all appeared to be effective modes of communication to our technologically- inclined generation. However, even with such advances, the voting rates continue to remain low. With all this effort drawing in only a small crowd, it seems plausible to conclude that students are just not interested in voting for the student government. It’s hard to argue that the DSU hasn’t made the effort to attract students to participate in the spring elections. The campus is bustling with flyers and enthusiastic campaigners motivating individuals to get excited and vote. My Facebook homepage is flooded with status updates from running officials, on top of all the handouts and buttons I’ve received at school. Some candidates have even gone to classes to speak of their positions and proposed changes. It seems the DSU has made a valiant effort to attract students, but will students respond? How many students are just voting for their friends, compared to how many are voting because they actually care about how the university is run? It’s reasonable to assume that a large proportion of the student population probably does not know about the different sectors of the DSU and what role the student government has in the day-to-day activities of the university. Does this mean that the DSU should spend more time educating students about the role it plays in their lives? Perhaps. Or perhaps nothing can be done. Students are smart enough to gather information about what their government does if they wanted too. All the DSU could do is possibly put up articles or make classroom presentations about their role, but how many students are really going to be paying attention? If students were passionate about the issues the DSU was fighting for, there would be greater support for them—just like the rallies for decreasing tuition or supporting gay rights. I’ve been at Dal for four years and I didn’t know anything about the DSU until one of my friends ran for a position on council. That alone motivated me to learn about what the DSU does; otherwise, I would have remained just as oblivious as previous years. If students were concerned about the issues, there would be far less effort into the aesthetics of the campaign and more time for voters to get to know their candidates. Not every issue will be fascinating, but each has an impact on our community and requires each of us to participate in decision making. However, if students don’t care, it seems ridiculous that elections exist. Clearly no one is exercising their freedom of voice through their votes. Blame should not be imparted onto anyone but the students themselves. I don’t think the DSU can promote the elections and even the issues any better then they already have. It’s not easy to engage students with topics that may seem boring and insignificant compared to their own problems, but the DSU has made resources available—websites, council members, events. The fact is, nothing more can be done to increase voter turnout, except that students need to accept responsibility for this privilege. 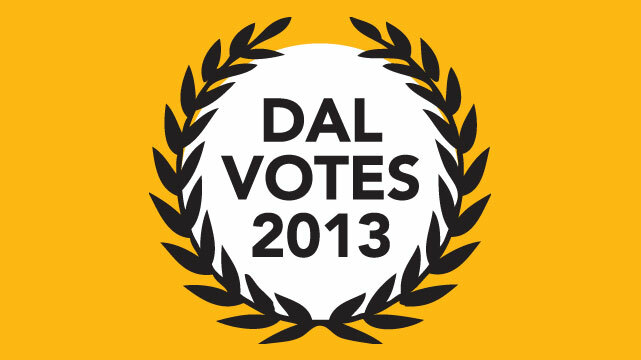 If not, maybe Dal can implement a fine for those who don’t vote, a law that prevails in Australia.